I raise angora rabbits for their wool. I am a fiber artist and I shear the wool, spin it, knit it and weave it into wearable art. In the summer of 1992 I bought worms at a bait shop to put under my rabbit cages to eat the rabbit manure and eliminate “flies.” One Problem: I bought the wrong kind of worms; these worms migrated in the fall. I then did more reading and found out that I needed to use a special worm–red wiggler composting worms, Eisenia fetida. I ordered red wigglers on the internet from Arkansas–$15.00 for 1000 worms. I ordered 3000 and I didn’t need to order more worms until 2009 when I went into business with a friend as The Worm Ladies of Charlestown, Inc. The red wigglers multiplied and solved the problem of too many “flies.” As a result, I discovered the “magic” of worm castings (poop). My gardens and my potted plants were the best due to this soil enhancer. I now have a much broader perspective of the soil food web. I continue this sustainable environment of rabbits, their manure, the worms, and their castings and my plants. Vermicomposting is a process that relies on earthworms and microorganisms to help stabilize active organic materials and convert them to a valuable soil amendment and source of plant nutrients. For me, vermicomposting is much easier than composting. Temperatures differ—composting is done thermophilically; vermicomposting is done mesophilically. Different bacteria predominate with each of the composting processes and each process handles weed seeds differently. Thermophilic composting can be 140 degrees F, it kills low temp bacteria and encourages high temperature bacteria, it may kill weed seeds, and needs to be turned periodically to heat up. Moisture helps but is not required. Mesophilic vermcomposting needs lower temperatures, 40-80 degrees F the ideal—lower temperatures are needed to keep the worms alive. Worms require moisture; they breathe through their skin. You can use a thermophilic stage first. The advantages of using worms in your compost are that there is no unpleasant odor when using the red wigglers because it is an aerobic process. Vermicomposting dramatically speeds up the decomposition process so the end product is available sooner. 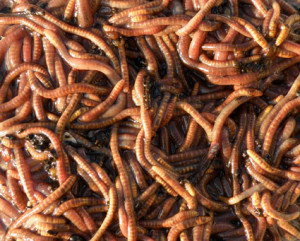 Red wiggler worms can compost as much as 35% of waste created in the home and garden. You save money by making your own soil enhancer that is organic, no matter what you feed the worms. Vermicomposting can be done under your kitchen sink, in your garage or basement, or in your yard. It is convenient, interesting, easy, and fun! Unlike most other earthworms, red wigglers are surface feeders with the ability to consume up to half their body weight in decayed matter each day so household and agricultural waste are an ideal food for the red wigglers who turn it into worm castings – Nature’s perfect food. This species of worm does not migrate so it can be easily kept in captivity if we provide a home, air, moisture and food. The worms do all the work! Worms are hermaphrodites (both male and female). Each worm can produce up to 2-3 cocoons or capsules per week which hatch out every 3 – 4 weeks producing tiny baby worms called threads. The baby worms that survive will mature to reproductive age in 1-2 months. Under healthy conditions there can be a rapid increase in population available to eat more garbage or to share with a friend. One mature worm will produce 1200 to 1500 offspring a year. Under ideal conditions with plenty of food and room in a well established bin, one pound of worms can double in three to four months. What are so amazing about worm castings? Worm castings, a fine particulate matter produced by the worms, increase diversity in the soil. The castings contain a highly active biological mixture of bacteria, enzymes, remnants of plant matter and animal manure. They are rich in water-soluble plant nutrients and contain 50% more humus than what is normally found in topsoil. They also contain a high concentration of nitrates, phosphorous, magnesium, potassium, and minerals such as manganese, copper, zinc, cobalt, borax, iron, carbon, and nitrogen—all in natural proportions. The beneficial nutrients found in castings are absorbed easily and immediately by plants (unlike chemical fertilizers and manure); they will never burn plants. Worm castings can be sifted for use in starting seeds. Mix with coir or peat moss and vermiculite or perlite. Do not use more than 20-40% castings in the mix. The castings are perfect for use on vegetables or flowers. Incorporate 1 part of castings to 10 parts of soil. This past summer I attended the Vermicomposting Conference at North Carolina State University. Dr. Norman Arancon, from the University of Hawaii-Hilo, presented twice on the benefits of vermicompost on plant growth. He listed the known benefits of vermicompost. Aids in pathogen suppression. Vermicompost won’t kill or eradicate pathogens. They are still present, but will remain non-virulent if kept in check by other micro-organisms. If the pathogen does attack, the plants will be able to better resist it. Regulates plant growth. If VC tests positive for hormones, fruits are bigger and will flower several weeks earlier. Dr. Arancon is a huge proponent of aerated compost teas (ACT) vs non-aerated teas (NCT). While both types of teas are created by steeping a “tea bag” of vermicompost in water, aerated teas are made by introducing the use of a bubbler, which over the course of several hours oxygenates the solution, activating a rocking microbial party within. Much higher in microbial activity in comparison to both NCT and thermophilic compost tea. I have done well with my castings without really knowing it. I have used the vermicompost on my plants and have made the aerated tea and I see the difference in plant growth. I know the rabbit manure helps to create better castings; the rabbits eat bagged rabbit feed as well as comfrey and kale. Now that I am getting more serious about the castings and the tea, I need to be very consistent in what I am feeding the worms so that testing under a microscope will be consistent. I know where and how my castings are created. To purchase castings from a source other than your own, you should have them tested and know what the worms are fed. To sell castings on any scale, you must have a process and a product that is reliable, repeatable and verifiable. The castings should be in breathable bags. Rhode Island has passed legislation that requires a limited number of food producers to divert the waste from the Central Landfill. The legislation is for restaurants, colleges and universities, and food wholesalers and distributors that produce 104 tons of organic material annually. But it is only if there is a composting or anaerobic digestion facility within 15 miles. Earth Care Farm in Charlestown is currently the only commercial-scale composting site in Rhode Island that takes food scraps. The Worm Ladies of Charlestown, Inc. along with other worm growers have created a Rhody Worms Cooperative. This Cooperative will establish large-scale and mid-scale vermicomposting facilities throughout the state, with a goal of having these facilities fill the gap of the 15 mile restriction. Food producers could create their own mid-scale worm farm at their facility, creating a cost effective solution. Additional large-scale worm farms can be established in the state to receive food scraps. The potential for the worm farms is the sale of worms as well as the worm castings, using the worm castings to grow more food. For individuals, families, schools and small cafeterias, we would continue to help them set up worm bins for the elimination of food scraps and the decrease of the use of chemical fertilizers. It is the most cost effective means for eliminating food scraps and more. Our mission is to encourage everyone to take care of their own garbage: first, by producing less garbage; second by composting and recycling what each one of us does produce; third by using worms we quickly and easily return some of what we have used to the earth. Join us! It’s fun and very rewarding.